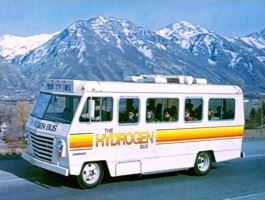 The Provo-Orem bus was a demonstration of hydrogen’s suitability for mass transportation applications. The larger vehicle could easily accommodate the added weight of the hydrogen stored in metal hydride form. The bus was also a demonstration of hydrogen’s added efficiency in stop-and-go driving – over 80% more efficient than its gasoline counterpart. The prospect of a central fueling location made the city bus project a perfect demonstration of hydrogen as an automotive fuel. All of his work is done within the ‘free enterprise system,’ which [Billings] said will not judge his achievements by the standards of academic research, but instead demand cars that run well enough to sell.